Are you looking for a planner that can help you manage your personal and professional life all in one place? 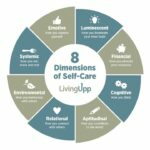 This beautiful life organizer was designed to help you establish and maintain an uplifting self-care practice that enables you to live up to your highest potential. Using Living Upp’s 8-dimensional self-care framework, you’ll learn how to identify where to best invest your time and energy within each of the eight unique dimensions of your life: Systemic, Emotive, Luminescent, Financial, Cognitive, Aptitudinal, Relational, and Environmental, and accomplish your goals without sacrificing your health in the process.